Make and bake cake mix as directed on box in 2 (9-inch) round cake pans, using water, oil and egg whites. Cool completely, about 1 hour. Return cooled cake layers into 2 clean 9-inch round cake pans. With thin stirring straw, toothpick or skewer, pierce cakes at 1/2-inch intervals. In 2 separate medium bowls, add 1 cup of the boiling water into each flavor of gelatin. Beat each with whisk until completely dissolved. With large spoon, drizzle raspberry gelatin over 1 cake; drizzle green gelatin over remaining cake. Refrigerate 1 to 3 hours to allow gelatin to set up in cakes. To remove cakes from pans, dip pans in warm water 10 seconds. Unmold 1 cake onto serving platter; spread 1 1/2 cups of the whipped topping on top of cake. Unmold second cake; carefully place on first cake on platter. Frost entire cake with remaining whipped topping. Refrigerate 1 hour before serving, or until ready to serve. Change the flavor and color of this fun, simple cake by swapping out the flavors of gelatin you drizzle over your cake rounds. 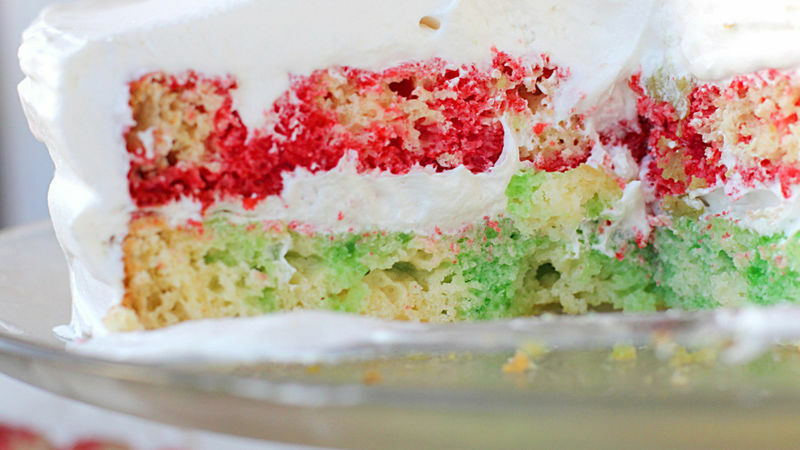 Decorate the cake with a few rainbow sprinkles to make it as festive on the outside as it is on the inside.